There are more than 260 species of Monkeys found in the world today. They are derived from early primates that have been around for millions of years. There isn’t enough information about evolution to say with certainty how they came to be. These primates range in size from only about 4 ounces to those that weigh up to 77 pounds. It isn’t fully understood what all has occurred with evolution to allow these Monkeys to branch off in so many directions. There is plenty of information though to indicate they have been around for more than 50 million years in so degree. The Monkey is a highly adaptable creature so they do well in a variety of environments. They are able to live in the trees or on ground depending on the specific species. They are also able to consume a wide variety of different foods. For most species fruits make up the majority of their diet. Many of them also consume insects. Almost all Monkey species are very social. In fact, they thrive on being around each other. They don’t do well in captivity if they are isolated and that can make it tough. Most zoos and other establishments don’t have the funding or the room for large numbers of these primates in a given area. The hierarchy that they develop among social groups is very interesting. This allows them to maintain order. With many of the Monkey species it is a female that is the authoritarian. There is also the possibility that offspring will inherit the social standing of the mothers. Communication is a key element in their groups. They use a variety of calls, clicks, and chatter to effectively communicate. They may be having simple conversations, heated arguments, or warning of dangers. Many experts believe that groups can develop their own unique variation of a language too. Then it will sound different from other groups of the same species of Monkey. For most of the Monkey species breeding can take place any time of the year. They will most likely mate though when there is plenty of food around. When they aren’t able to get enough of it they will stop breeding to help control the population. There is usually only one or two young born with most of the species. The smaller ones are the species most likely to have the twins. They are very good at caring for the young. They nurture them, teach them, and even reprimand them just like real children. These young Monkeys are playful, curious, and even mean to each other at times. Depending on the species they will either stay in the group for life or they will leave when they reach the age of maturity. Monkeys are extremely intelligent and they have a brain that is very large. They are able to problem solve and they use their minds in mysterious ways. They are able to use tools in order to create nests, to drink water, and even to defend themselves. They may use rocks or sticks as tools for accessing food supplies. 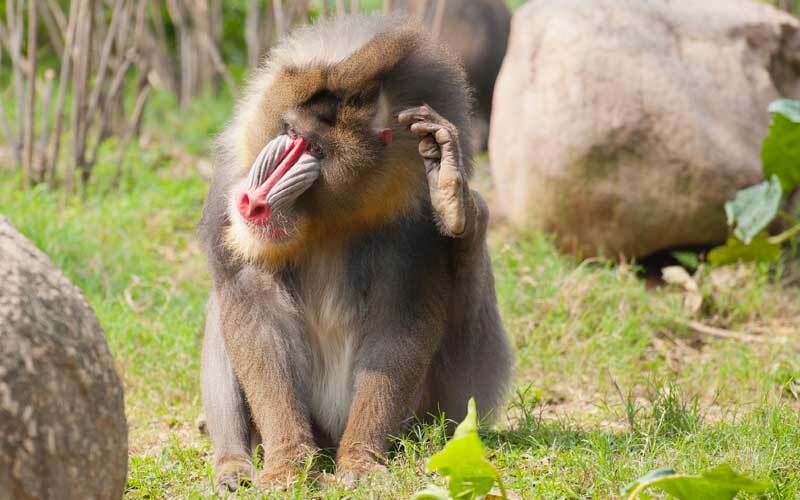 Most Monkey species don’t have too much trouble with predators. They may have some concerns with birds, large cats, the Hyena, and more. However, humans continue to be the largest overall threat to them. Many of them are eaten, illegally sold for lab tests or for sold for pets. Due to the humans destroying the Monkeys natural habitat out there, many of them are at dangerously low numbers. There is a good chance that they will not be able to survive for much longer. Even with lots of conservation efforts in place it is still going to be a very tough battle.